This is an example feedback comment so that you may see what the feedback page will look like. In addition to the basic comment listed here, I will also reply to this comment so that you may see what a reply will look like. We look forward to your comments. Good and bad feedback will be posted after it has been evaluated to ensure it is not spam. And as promised here is the reply so that you can see how it will be formatted. We look forward to your feedback. When you say it is not working, could you please be more specific so that I can try and correct your issue. As a start you might check out our Help Page for a solution to common problems and a tutorial. You are welcome. It was a nice challenge. I am entering positions I know how to solve in very few moves. Sometime it works, other time it does not. I think I know how to follow the instructions properly because sometimes it works. One solution was 22 moves long and I successful executed it. work. Another was only 11 moves long and it did not. I have had similar experiences and when I use it myself I have found that it is easy to miss steps because often times it will be two times in a row the same move. It is very easy to skip a step which will result in a not solved cube. Thank you for your feedback. I will investigate methods to improve the instructions so it is not as easy to skip steps. wonderful, now if I could backwards engineer this! http://www.wrongway.org/?rubiksource - The link above is a good source for computer code to create your own solver programs if you truly want to backward engineer stuff. I use a modified version of the 3x3x3 code for the solver on this website. Visits my Links page for other rubik cube solver sources. MY cube isn\'t solved. did i use it correct? There are a couple possibilities if the solver is giving you an error. You could be entering the face colors incorrectly, in which case check out the tutorial on the help page for an video of how to do it correctly. The second reason it may not be solving is if your cube was destickered or taken apart and not put back correctly. 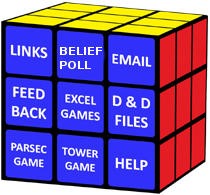 The solver assumes you have a standard unmodified cube. Wow. Just wow. From a scrambled mess to 22 moves later, a nice fixed cube. How does that even happen??! Great job on this! You need to rename your site. My \"opposite cube\" position timed out before it was solved, even though your site says it is \"valid\" position. All 20 independent pieces are in exactly the opposite position relative to the 6 fixed centers as they would be if the cube was solved. Ever two sided piece has each side adjacent to the opposite color fixed center. I can solve this cube in 1 minute and 40 seconds. Your CPU time out before it was solved. In the few cases that the solver doesn't find a solution, generally you can jumble it a few more turns and the algorithm will work. I have to limit my CPU time due to server limitations. Thank you for your feedback. I am very grateful for your site. It has confirmed that some of the solutions I have come up with for cube tricks are as efficient as the wonderful algorithm. My goal was, base on theory, to create a position that was base on a set of rules that was as far from being solved as is mathematically possible. Can you confirm that this version of an opposite cube takes 24 moves? If you could, I would much appreciate it. If you would email me a screenshot of the cube configuration you are talking about I will certainly take a look at it. It may take sometime to get an answer back. I have a day job as this site is just a hobby and doesnt really make money since it is free, so my time is limited. The email is admin@rubiksolve.com. Thanks again for the feedback and interest. This is so cool! My brother messed up my cube on the first day, and I thought I would never fix it. But I did, using this website. Thank You! I love your Rubik\'s cube solver! SnDvDH Very good blog.Thanks Again. Really Cool. I love the website a lot. I got my first Rubik\'s cube done on it. I have an idea that will make it even better. I think you should do not only 3X3 but also 4X4, 5X5, and 2X2. Excellent. It worked first time. Thoroughly recommended. Really happy, got my friend to solve it then mucked it up within 5 minutes. Then i found THIS site that allows you to submit your own center pieces, which allows me to solve my original rubik\'s cube!!! Thanks for the solver. My 10 year-old had the cube for Christmas and was quite distressed when her older brother jumbled it up first. Now she can have the pleasure of starting it herself.